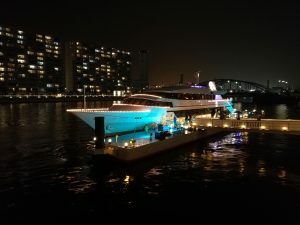 AJS and ACCJ held ” Nomu-Nication” Program together on Friday, September 14th at Cruise Club Tokyo. 50 AJS members and 60 ACCJ members joined this program and spent enjoyable and meaningful time to communicate and to know other members. 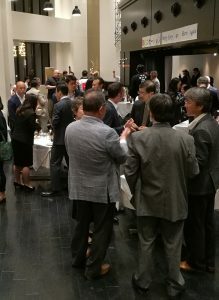 During the event, they enjoyed not only their chats, but also lottery and JAZZ music by the Waseda New Orleans Jazz Club, and lastly everyone sang a song *”Happy Days Are Here Again! !” together. *This song used to a top hit chart in early 1930s when alcohol prohibition wended in U.S.
After Nomu-Nication event, some participants enjoyed an optional cruise on Tokyo Bay getting on board the ship Lady Crystal. Both AJS and ACCJ members were able to deepen a friendship.